Patrick Hook is a director for P.D. Hook (Hatcheries) Ltd, which is the UK’s largest independent chick supplier. The business has rearing, breeding, hatching and growing farms throughout the UK. 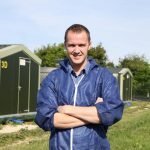 Patrick grew up with the business and after completing a degree in Business Management at Aberystwyth University in 2008, he worked on the farming and hatchery base before becoming an area and hatchery manager. Patrick’s current role is managing the production and planning of day old breeder placements and broiler chicks for the group. In 2015 he was selected for a Nuffield Farming Scholarship and travelled to New Zealand, USA, Hungary, Holland and Australia. His study was, 2050: The Challenges and Opportunities to the UK Broiler Industry and focused on genetics, farming systems, people, and consumer and retailer perceptions. Patrick was also selected for the Oxford Farming Conference Emerging Leaders programme in 2017 and also formed the poultry section of the FRAgS report into the future of Animal Production in Lowland UK. Outside of work Patrick is a keen game and clay shooter. He sits on the Royal Agricultural Benevolent Institution, Oxfordshire committee, is a Vice President of the South East Area Young Farmers. He lives in West Oxfordshire with his wife Grace and two children Joseph and Evelyn.